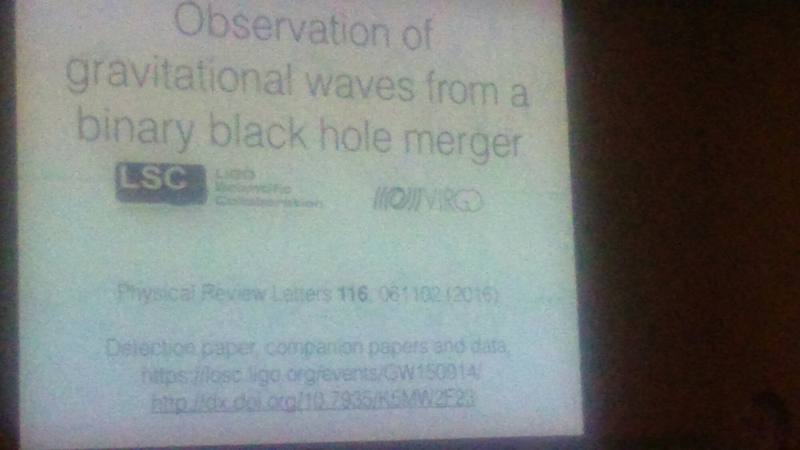 My monthly trip to London for the Royal Astronomical Society Meeting allowed me not only to get out of the office for the day but also to attend a nice talk by Alberto Vecchio about yesterday’s amazing results. I had to miss this meeting – because I was involved in a special Senate meeting on Friday afternoon – but I did make it to the “famous RAS Dining Club” afterwards where I had a brief chat with the author of this post, Cormac O’ Raifeartaigh. 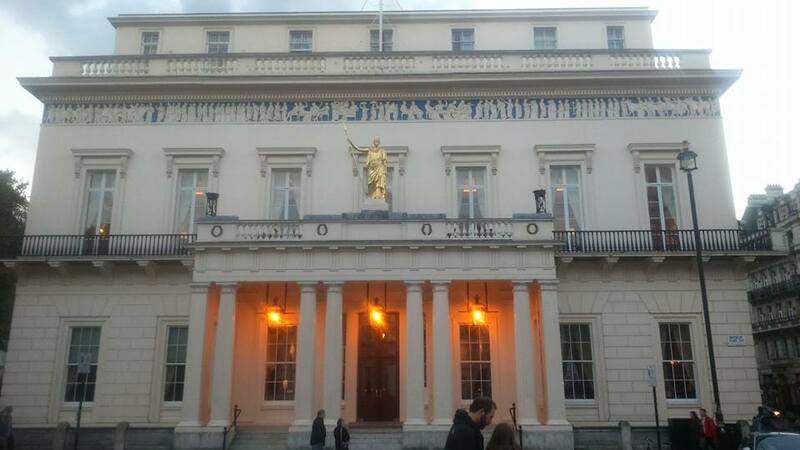 Here, for reference, is the Athenaeum, where we dined on Friday.. The birth centenary of the noted British astrophysicist Sir Fred Hoyle was celebrated on Friday at the Royal Astronomical Society with a one-day meeting of talks describing Sir Fred’s many contributions to 20th century physics. While he is chiefly remembered in some quarters as the physicist who was ‘wrong on the big bang’, Sir Fred in fact made a number of seminal contributions to modern physics in several fields. Indeed, it was a treat to witness former collaborators and students recall his contribution to stellar nucleosynthesis, accretion physics, stellar structure, astrobiology and cosmology, to name but a few. Gay Astronomers – At Last Some Data! Some time ago I wrote a blog post entitled Where are all the LGBT Astrophysicists. I wrote that piece when I accidentally discovered that somebody had recently written a blog post (about Einstein’s Blackboard) which mentions me. I used to look after this famous relic when I was in Nottingham many years ago, you see. Professor Coles is one of the few out gay astrophysicists in the UK. Well, it all depends by what you mean by “few” but at the time I wrote that I thought there are more gay (or lesbian or bisexual or transgendered) astrophysicists out there than most people probably think. I know quite a large number personally- dozens in fact- most of whom are “out”. It’s a safe bet that there are many more who aren’t open about their sexuality too. However, it is probably the case that LGBT scientists are much less visible as such through their work than colleagues in the arts or humanities. Read two research papers, one written by a straight astrophysicist and one by an LGBT astrophysicist, and I very much doubt you could tell which is which. Read two pieces of literary criticism, however, and it’s much more likely you could determine the sexual orientation of the writer. You might ask why it matters if an astrophysicist or astronomer is straight or gay? Surely what is important is whether they are good at their job? I agree with that, actually. When it comes to career development, sexual orientation should be as irrelevant as race or gender. The problem is that the lack of visibility of LGBT scientists – and this doesn’t just apply to astrophysics, but across all science disciplines – could deter young people from choosing science as a career in the first place. Anyway, at last we have some evidence as to whether this might be the case. In 2014 the Royal Astronomical Society (of which I am a Fellow) carried out a demographic survey of its membership. This happens from time to time but this one was the first to include a question about sexual orientation. The Institute of Physics did a similar survey about Physics about a decade ago, but did not include sexual orientation among its question, so this is the first time I’ve seen any data about this from a systematic survey. The results are quite interesting. About 7% of UK respondents (from a total of around a thousand) refused to answer the sexual orientation question but, among those who did, 3% identified themselves as bisexual and 4% as gay men. Both these proportions are significantly higher than the figures for the general UK population reported by the Office of National Statistics. The fraction of respondents in the RAS Survey declaring themselves to be heterosexual was 84%, whereas the corresponding figure from the ONS Survey was 93.5%. The number of UK respondents in the RAS Survey identifying as lesbian was only 0.2%; the proportion of respondents identifying themselves as male was 77.5% versus 21.3% female, which accounts for only some of the difference between gay and lesbian proportions. So, according to the survey, gay men are actually significantly over-represented in the Royal Astronomical Society compared to the general population. That confirms the statement I made earlier that there are more gay astronomers than you probably think. It also shows that there is no evidence that gay men are deterred from becoming astronomers. In fact, it seems to be quite the opposite. It’s a different story when it comes to other demographics, however. The RAS membership is older, less ethnically diverse, and more male-dominated than the the general population, so there’s a lot of work to be done redressing the balance there. On the other hand, next time the Royal Astronomical Society is looking to elect a President it will naturally want to find someone who is representative of its membership, which means an ageing white gay male. I rest my case. Life, the Universe and the Partial Eclipse..
As you will no doubt be aware, tomorrow there will be a Partial Eclipse of the Sun visible from the United Kingdom. 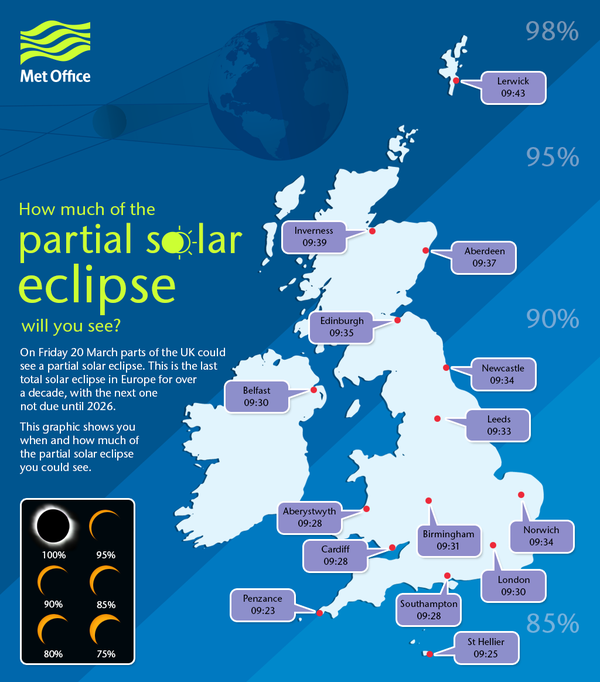 Here’s a handy guide, courtesy of the Met Office, to the time and maximum fraction of the Sun’s disk that will be obscured. Unfortunately the weather forecast for Brighton isn’t marvellous so it’s possible that the main event will be obscured by cloud and all we experience is that an already dark and gloomy morning gets even darker and gloomier. However, in the event that the weather forecast turns out to be inaccurate, which is far from unheard of, please make sure you follow the official Royal Astronomical Society guidelines to make sure you observe it safely. And while I’m at it, here is a video of a nice lecture by Ian Ridpath explaining all about Solar and Lunar Eclipses. As a spectacle a partial solar eclipse is pretty exciting – as long as it’s not cloudy – but even a full view of one can’t really be compared with the awesome event that is a total eclipse. I’m lucky enough to have observed one and I can tell you it was truly awe-inspiring. If you think about it, though, it’s rather odd that such a thing is possible at all. In a total eclipse, the Moon passes between the Earth and the Sun in such a way that it exactly covers the Solar disk. In order for this to happen the apparent angular size of the Moon (as seen from Earth) has to be almost exactly the same as that of the Sun (as seen from Earth). This involves a strange coincidence: the Moon is small (about 1740 km in radius) but very close to the Earth in astronomical terms (about 400,000 km away). The Sun, on the other hand, is both enormously large (radius 700,000 km) and enormously distant (approx. 150,000,000 km). The ratio of radius to distance from Earth of these objects is almost identical at the point of a a total eclipse, so the apparent disk of the Moon almost exactly fits over that of the Sun. Why is this so? The simple answer is that it is just a coincidence. There seems no particular physical reason why the geometry of the Earth-Moon-Sun system should have turned out this way. Moreover, the system is not static. The tides raised by the Moon on the Earth lead to frictional heating and a loss of orbital energy. The Moon’s orbit is therefore moving slowly outwards from the Earth. I’m not going to tell you exactly how quickly this happens, as it is one of the questions I set my students in the module Astrophysical Concepts I’ll be starting in a few weeks, but eventually the Earth-Moon distance will be too large for total eclipses of the Sun by the Moon to be possible on Earth, although partial and annular eclipses may still be possible. It seems therefore that we just happen to be living at the right place at the right time to see total eclipses. Perhaps there are other inhabited moonless planets whose inhabitants will never see one. Future inhabitants of Earth will have to content themselves with watching eclipse clips on Youtube. Things may be more complicated than this though. I’ve heard it argued that the existence of a moon reasonably close to the Earth may have helped the evolution of terrestrial life. The argument – as far as I understand it – is that life presumably began in the oceans, then amphibious forms evolved in tidal margins of some sort wherein conditions favoured both aquatic and land-dwelling creatures. Only then did life fully emerge from the seas and begin to live on land. If it is the case that the existence of significant tides is necessary for life to complete the transition from oceans to solid ground, then maybe the Moon played a key role in the evolution of dinosaurs, mammals, and even ourselves. I’m not sure I’m convinced of this argument because, although the Moon is the dominant source of the Earth’s tides, it is not overwhelmingly so. The effect of the Sun is also considerable, only a factor of three smaller than the Moon. So maybe the Sun could have done the job on its own. I don’t know. That’s not really the point of this post, however. What I wanted to comment on is that astronomers generally don’t question the interpretation of the occurence of total eclipses as simply a coincidence. Eclipses just are. There are no doubt many other planets where they aren’t. We’re special in that we live somewhere where something apparently unlikely happens. But this isn’t important because eclipses aren’t really all that significant in cosmic terms, other than that the law of physics allow them. On the other hand astronomers (and many other people) do make a big deal of the fact that life exists in the Universe. Given what we know about fundamental physics and biology – which admittedly isn’t very much – this also seems unlikely. Perhaps there are many other worlds without life, so the Earth is special once again. Others argue that the existence of life is so unlikely that special provision must have been made to make it possible. Before I find myself falling into the black hole marked “Anthropic Principle” let me just say that I don’t see the existence of life (including human life) as being of any greater significance than that of a total eclipse. Both phenomena are (subjectively) interesting to humans, both are contingent on particular circumstances, and both will no doubt cease to occur at some point in perhaps not-too-distant the future. Neither tells us much about the true nature of the Universe. Perhaps we should just face up to the fact that we’re just not very significant…. What was that quotation by Oscar Wilde, “We are all in the gutter, but some of us aren’t reading the Daily Mail“? Last week that particular element of the gutter press took the opportunity to display its aptitude for racism and sexism in a snide piece about the appearance of two female (shock!) and non-white (horror!) scientists on Newsnight. It’s not really a surprise that the Daily Mail would publish such a scummy article, but it’s still depressing to see how the minds of some people work. For the record I’ll say that I only know one of the scientists concerned personally (Hiranya Peiris of University College, London). Speaking as a cosmologist, I’m sure I’m not alone in saying that if someone from the press had phoned me up and asked me to suggest an expert to invite onto a television show to explain the BICEP2 results then Hiranya would have been right at the top of my list – because she’s a brilliant scientist (in exactly the relevant area) and a gifted communicator to boot. Is it really so hard to grasp the idea that a brilliant scientist can be female? Or born in Sri Lanka? Anyway, University College was quick to criticize the Daily Fail in an open letter from Professor David Price, Vice-Provost for Research. Meanwhile a flurry of enraged emails was going around the Council of the Royal Astronomical Society (of which I am a member) that led to a collective response being issued on Friday. Here follows the RAS statement on the matter which I reproduce here in full, apart from the link to the offensive Daily Mail “article” which I have removed because I don’t want them to profit from traffic sent by this blog. The statement was written by RAS President David Southwood and RAS Press Officer Robert Massey who are to be congratulated for their measured yet forceful riposte. The last two paragraphs are particularly good. I’m glad the task of responding to the Daily Mail wasn’t left to me. I would have been far less diplomatic. The Council and President of the Royal Astronomical Society (RAS) have offered unequivocal support to astronomers Dr Hiranya Peiris and Dr Maggie Aderin-Pocock. An article in the Daily Mail suggested that they were selected to appear on an episode of theBBC Newsnight programme on the basis of their ethnic background, nationality and gender. The two astronomers discussed results from the BICEP-2 experiment announced earlier this week, which offered evidence of gravitational waves in the early universe and for a rapid expansion of the cosmos (known as inflation) shortly after the Big Bang. If confirmed, this discovery is of huge significance and was rightly covered by news media all over the world. Dr Peiris is a world-leading cosmologist now based at University College London (UCL), with degrees from Cambridge and Princeton. In 2012 she received the RAS Fowler Award in recognition of her immense contribution to her field at an early stage of her research career. Dr Aderin-Pocock has a background in space engineering and science communication and is now co-presenter of theBBC’s The Sky at Night, a role which demands the ability to convey complex ideas to the public at large. Both scientists are thus exceptionally well qualified to discuss the BICEP-2 results and were natural choices for the Newsnight piece. In the Daily Mail article, columnist ‘Ephraim Hardcastle’ (the nom de plume of Peter Mackay) not only ignored their expertise entirely but incorrectly suggested that the BICEP-2 team consisted only of white, male, American astronomers. Astronomy world-wide has long ceased to be a closed male world and the backgrounds of astronomers have long been culturally diverse. Specifically in Britain, women now make up 27% of UK university lecturers in astronomy [see e.g. the RAS Demographic Survey (2011)] and lead space- and ground-based research projects alike. RAS President Prof. David Southwood commented: “Astronomy did not begin in Western Europe and has always been an international science. Today researchers from many nations and many cultures routinely work together to achieve shared goals. In the UK, our field is enriched by some of the most talented people from all over the world who choose to join teams in this country. So here I am in Cardiff for the weekend, relaxing after a very busy and stressful week. It’s nice to have the option to get away like this, especially in the spring sunshine, so I’m glad I kept the Cardiff house going rather than try to sell it the moment I got the job at Sussex University. I have been working very long hours recently and with another month to go before the end of teaching term, I think I need to make better use of the weekends if I’m going to avoid a state of complete exhaustion. On Friday I attended a meeting of the Council of the Royal Astronomical Society (of which I am an elected member) followed by a very interesting Open Meeting and a nice dinner with the RAS Club. After all that I took the late train to Cardiff instead of going back to Brighton. During the journey I thought quite a lot about Tony Benn; the news of his death at the age of 88 was announced on Friday morning. Although I didn’t agree with his political views on some things, he was a person I admired enormously and I am very sad that he is no more. I only ever met Tony Benn once, many years ago, as it happens, on a train from Brighton to London. It was one of those old-fashioned carriages, divided into compartments each with a door. I had almost missed the train and was so flustered when I got on that it took me some time to recognize the gentleman opposite who was just lighting his pipe. I summoned up the nerve to speak, shook his hand, and introduced myself. We were the only occupants of the carriage and we talked for the entire journey – an experience I’ve never forgotten. In person Tony Benn was wonderful: charming, kindly, impeccably polite and above all absolutely fascinating to talk to. As I recall it, I did most of the listening. Not that I minded. I’m a man who likes talking to a man who likes to talk..
People also forget that Tony Benn was one of the very few politicians to champion LGBT rights. It’s now a fashionable thing, but it wasn’t then back in the dark days of Section 28. So I’d just like to record a little personal farewell to Tony Benn. There’s nobody of his stature in current British politics, and none whose company I’d like to spend a train journey in, either. Yesterday I was out and about in sunny Cardiff running various undemanding errands, in the course of which I came across an internet cafe. I’ve never actually used one of those before, and was quite surprised that an hour’s access cost just £1. I took the chance to sit down for a bit and wrote yesterday’s blog post there. Saturday was the last day of the Six Nations rugby and Wales were hosting Scotland. The two sets of supporters were mingling and imbibing throughout the city. When it came to the match, Wales thrashed Scotland 51-3. Earlier England had comfortably beaten Italy so were top of the table, but would only win the competition if Ireland lost the last game to France in Paris. It was an exciting finale, with stout Irish defence enabling them to cling on to a lead of just two points. So well played Ireland, who probably deserved the title, but also good signs for England whose young side have performed admirably this year. Better luck next year? At least English supporters can now enjoy one of their favourite pastimes: blaming everything on the French. It’s warm and sunny again today so I think I’ll take another walk around. I really miss Cardiff, but one has to follow one’s star wherever it leads. For a long time astronomers and other scientists believed that the importance of their work was evident to society. But in these difficult days of financial austerity, even the most obvious benefits of science have to undergo careful scrutiny. Eradicating poverty and hunger is a worldwide priority, and activities that do not directly attempt to resolve these issues can be hard to justify and support. However, several studies have told us that investing in science education, research and technology provides a great return not only economically, but culturally and indirectly for the population in general and has helped countries to face and overcome crises. The scientific and technological development of a country or region is closely linked to its human development index a statistic that is a measure of life expectancy, education and income. The full text of the paper can be found on the IAU website here. The article focusses on matters relating to the transfer of technology between astronomy and, e.g. industry, aerospace, and medicine, its effect on technology we are familiar with in everyday life, on astronomy as an exemplar of international collaboration and on its wider cultural and philosophical impact. Many of the points made in this article can also be found in the Royal Astronomical Society‘s free publication Beyond the Stars: Why Astronomy Matters which is available for free online here. I recommend you read the full article and make your own mind up about why astronomy is important. I have just two comments, which are partly questions. The first is that I’ve always had a bit of a problem with the interpretation of correlations like that mentioned in the last sentence of the abstract (between technological development and the human development index). The issue is the basic one that correlation of two phenomena does not necessarily imply that one causes the other. Is it really possible to establish rigorously a causal link between spending money on astronomy and wider societal benefits? I’m not saying that there isn’t such a link, just that it’s difficult to interpret evidence which is dependent on so many factors. Could one not argue instead that more developed countries spend more money on astronomy because they can afford to? The other thing that troubles me with arguments of the type presented in the paper is that there is a danger that emphasizing the transfer of knowledge to other disciplines as the rationale for funding astronomy implicitly negates the argument that astronomy has intrinsic worth of its own. In other words, answering the question “Why is Astronomy important?” seems to accept at the outset that it isn’t. If it is indeed the case that we can only justify astronomy because it has produced spin-offs in, e.g., medicine, why not just spend more money on medicine and forget the astronomy? I’m not saying that the technology transfer arguments carry no weight, just that they are definitely double-edged and should be used with caution. For the record, I think we should fund Astronomy (and other sciences) primarily because they are an essential part of the fabric of our culture and civilization; all the rest is icing on the cake. In other words, I support state funding for the sciences for very much the same reasons as for the arts. I’m fully aware, however, that this unlikely to persuade the powers that be as effectively as an appeal to economic benefits; that’s why science funding has fared so much better than arts funding in this age of austerity.